It has been a long journey since the conception of these unique custom dice in my kitchen and since we launched this Kickstarter campaign through which, together, we tried to get these dice manufactured on a broader scale. 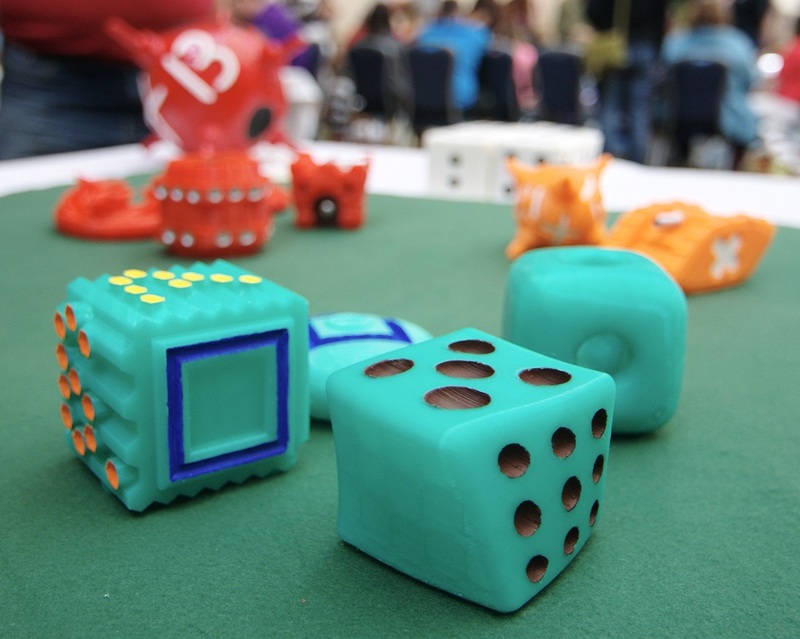 Thanks to you, we were able to redesign the game in 3D printing; develop it in China; simplify the dice and the rules to make a better product; reproduce the prototypes; propose the game to several game publishers of the world's most famous toys; and showcase the game at the most prestigious game fairs in the U.S., all in a continuous effort to launch the project in defiance of all the bumps on the road. I hoped to come back to you with good news -- a signed contract for the publication of the game and the joy of finally bringing it to you and to the world, but Dice Age did not make it to this stage. Despite all of our efforts, this project didn't come to life. As hard as it is to do, it is time to acknowledge this and to move on. I am proud of all that we were able to accomplish together, and I want to thank all of you guys for having believed in this Kickstarter project. I am forever grateful for your faith and patience. I also want to encourage those who backed this project as their first and/or only Kickstarter project to keep your faith and continue to support other projects that you believe in. The overwhelming majority of projects and startups such as this one never come to fruition, but this risk is inherent any time we endeavor to contribute something positive to the world. So many of the inventions that we enjoy today and take for granted were created by people who experienced fits and slow starts. Their projects haven't always been successful, but pushing forward and continuing to dream and to create despite setbacks -- that's how greatness is achieved. Stephen King didn't get his first book published until after he received dozens of rejection letters, and as we know he's gone on to become one of the world's most successful writers. So it is important and essential to stay positive and to keep inventing, dreaming, creating, and investing in big ideas. Thank you to all of you and may this new year bring the best to you. Kublacon 2013 was a success for Dice Age. Along with backer TarePanda and his spouse, we reworked the game and ran a demo with giant dice, and the game system has been put through the trail by fire. It takes time to finally get a formula that really works. We can at last say we are there: Dice Age, the game is ripe. It reached maturity. Let's face it: so far, the gameplay had a lot of flaws. We were aware of that and we relentlessly worked on finding a game that works perfectly. Even if the dice were initially meant to be played in several ways, we needed a single killer game, clear, reactive, of plain and simple fun. Dozens of players at Kublacon can testify, the game is good, excellent, and moreover, outstanding. We met the organizers of Con-volution, who were eager to see us run Dice Age events so we will certainly meet there in November. What was done to the game? The rules have been trimmed to fit to today's standards of boardgaming. The excess was trimmed too. We kept the core, so that players wouldn't be overwelmed with exceptions and the like. The current files can be found here below (since we will redesign the website to shift to Wordpress, an address would be likely to change), please note that the final rules will need to be proof-read by native English readers but they should be clear enough to play. We could even start a small game right here: you are welcome to propose your corrections as a comment. This is the game as it will be developed from now on, to stem Dice Age to the world: 12 Dice Age dice, 20 D6, 9 effects. It's so simple and so fun and reactive you can't miss it. Don't get over yourself, one still doesn't understand anything by just watching. But the game really flows and tactics work. We are currently working with Panda games manufacturing (yeah lots of pandas, I know) on the manufacture of industrial dice, as scheduled, and finally getting out of the seemingly endless and dark era of hand made dice. We still have many steps ahead, but we really believe this starter set will get Dice Age to take off. One of the dice needed to play Dice Age was not existing when we launched the Kickstarter, so it will be the extra die with every reward in replacement for Olympus. Those who already received their reward and lack the MUON die to play the new system can replace it by the NITRO die. We will still keep a printable PDF online version, that will seal the gaming system for good. As it only involves 12 dice today, the other Dice Age dice, are a prospective on the future of the game. We will start working on how to insert them within the final gaming system, so hold on to them! Castle: 4 D6 representing four Towers. Consider it as your life counter: when all Towers show 1, you lose the game. D6: regular six-sided die, Grunt, or Tower. Deck: Zone of summonable and unplayed Minions, located on your left, in front of you, out of the mat. Defender Dice: Grunt or Fighter involved in an Attack on the defending side. Effect: Power of altering the course of the game granted by the roll of an icon. Fighter: Minion showing a number. Used: Played Dice unavailable for action. They are kept on your right, in front of you, on the mat (Used Zone). Ready: Minions kept on an Effect or a number, usually after a roll. They are available for action. They are kept on your left, in front of you, on the mat (Ready Zone). Attack: A set of dice involving both attacking and defending groups that will inflict damages to each other, and potentially to the defender's Castle. Grunt: Regular six-sided die (D6) used as a resource in the game. Grunts can be assigned only 1 action in a single turn and are discarded during the turn they are used. Tower: Regular six-sided die used as a life counter. They represent the towers of your Castle. Wasteland: Zone of discarded and unavailable Minions, located to your right, in front of you, out of the mat. Dice age is a game for two players that confront each other using special dices in a battle to destroy the opponent's castle. You raise an army of fighter dice and unleash devastating spells to turn the fate in your favor. The first player to successfully dismantle all four towers of his opponent's Castle wins the game. 12 small six-sided dices, called Grunts. 8 large six sided dices (4 gray and 4 black) used to represent the damage level of each player's Castle, called Towers. While weak fighters, Red Minions can bring chaos and destruction. Yellow Minions are of sheer firepower. They take any battle to the next level. Your most tremendous fighters. Your opponent will curse you when they join your army, but beware: they are a double-edged blade. A playing mat to represent the conflict area. The first player to destroy all four Towers of his opponent's Castle is the winner. Player receives new Grunts and enrolls new Minions in their army. Players prepare for the next battle and declare attacks and defenses. Each player takes his 4 Tower and put them on the 6 side in the Castle area. Each player rolls a Grunt, the player with the highest result distributes the Minions and starts the game! Roll all the Minions of one color at the same time. Give each player the Minion that lands closest to his side of the mat. For red and green, give two Minions to each player instead of one. Each player should have the same amount of Minions and at least one of each color. Put all the Minions on the center of the table. Take turns between players to pick up one Minion of your choice at a time from the center to your Deck. The Deck (outside of the mat, to the left) is the player’s pool of summonable Minions. The Wasteland (outside of the mat, to the right) is where the discarded Minions go. The Ready Zone, (on the mat, to the left) is the player’s pool of Minions available for action. The Used Zone, (on the mat, to the right) is the player’s pool of Minions unavailable for action. We use D6 and special Dice Age dice. Regular six-sided dice (or D6) Use as many regular Six-sided dice (D6) as needed. Four D6 constitute the four Towers of your Castle. They are used as counters. They are never rolled. Other D6 are called Grunts. You get a certain number each turn, which you can discard (i.e. trade back with the Grunt reserve) to proceed with in-game actions. They are used as tokens. They are seldom rolled. NOTE: You can not have more than 6 Grunts maximum on your side at any time. Special Dice Age dice constitute your fighting forces. They are called Minions. They start the game on the Deck. You summon them on the mat by discarding Grunts. They allow you to attack the other player's Castle. They always belong to a precise Zone. Keep their showing side up after you rolled them. All dice must land completely on the mat when rolled. Re-roll them otherwise. Read any die by looking at it from the top. This phase is used to deploy and Load Minions. At the beginning of your turn, you get 2 Grunts, plus 1 Grunt per Used Minion you have on the mat. Thus, you start your first turn with 3 Grunts. Recall: You can not have more than 6 Grunts on your side at any time. Put your Defenders, if any, on the Ready zone of the mat without changing the top side. If a player has no more Minion in his Deck, all his Minions in his Wasteland go back to his Deck. Color of the die you want to roll? Note: Choose wisely which Minion to deploy and how many Grunts to spend, as attacks and effects are also costly in Grunts. 4. Roll the Minions: Roll all your newly deployed Minions and all your Used Minion at the same time. After this roll, your deployment phase is over and you cannot deploy any more Minions this way. This phase is used to position Minions and plan your tactic for the turn. 1. Immediate effects: Apply immediately the Immediate Effects you just rolled (Refer to the Table of Effects). You choose the order of Immediate Effects resolution. 3. Numbers: Put the numbers you just rolled on your Defenders' zone of the Mat. These Minions turned into Fighters. The number represents their Force. Fighters deployed this turn can only defend. On your next turn, they will be able to defend and attack. On your turn, you can declare attacks with your Ready Fighters. You need 1 Grunt to join each attacking Fighter. Announce the attacks (1 Fighter + 1 Grunt) by pushing them forward on the Battleground. Your opponent declares defenses with Ready Fighters or Defenders, each of them with or without a joining Grunt, by pushing them forward on the Battleground, in front of each attack. Several Fighters can be pushed in front of the same Attack. When all attacks and defenses have been declared, resolve attacks one by one. Resolve structural damages (unblocked Attackers) last. For each attack, both players roll the fighting Grunts. Add the numbers shown by your Fighters and your Grunts. These are the damages dealt to the opposing Group. They will determine a losing and a winning Group. 1. Losers are completely discarded: Fighters go to the Wasteland and Grunts are discarded. 2. Discard winners according to the damages received, starting with the most valuable Die (highest numerical value Fighter or Grunt). NOTE: If the most valuable Die of one group does not receive enough damages to be discarded, no Dice are discarded in this Group. NOTE: In case of equal value, Fighters are discarded in priority over Grunts. 3. All joining Grunts are discarded after damages resolution. 4. Surviving Fighters (Attackers and Defenders) go to their Used zone. NOTE: If Damages are equal on both Attacking and Defending sides, all Fighters go to the Wasteland and all Grunts involved in the Battle phase are discarded. Any excess of damages from an attack will be dealt to a defending Tower and lower that Tower by that much. If a Tower reaches 1, all further damages from this same attack are ignored. A Tower reaching 1 has collapsed and cannot receive any other damage until the end of the game. A tower that didn't reach 1 can receive damages from more than one attack during the same turn. A player is allowed to keep Grunts that weren't used this turn. Recall: Discard all Grunts in excess of 6. Grunts can be used for one action only in a single turn and are discarded during the turn they are used. Nothing is retroactive. On the regard, the moving of a Minion is the milestone in the game's timeline. Effects are only applicable during your turn. Apply the Effect as described on the table below and put the Minion in the Used zone. It will need to be made ready to be used again. Some Effects require the discarding of Grunts or Minions. On your turn, you can choose to discard 1 Grunt to use a Minion without applying its Effect. Put it in the Used Zone. Immediate Effects are immediately used. When multiple Immediate Effects are rolled at the same time, the player whose turn it is chooses the order of Immediate Effects resolution. Any Effect that cannot apply fully by lack of substrate reaches a limit and is maxed out: apply it up to what is possible. Roman Numeral: Counts both as an Immediate Effect and a Number. The Minion goes to the Defenders Zone as a normal Fighter. Chaos: All players re-roll all Minions on the mat. They are treated as just rolled. The player whose turn it is chooses the order of all (including Opponent's) Immediate Effects resolution. Pit: If there is no opponent Grunt to discard, lock the Minion and the Pit effect does not take place. Triangle: The extra Grunt comes from the Grunts Reserve. Cannon: As regular structural damages, they are distributed by target player on a single Tower. Square: A Square cannot lock itself. Our backers are very diverse and we have to consider every kind of backer in our communication moves. Some backers got tired of reading about the project, and just want their dice in the mailbox. Our updates were taken for just excuses, which considering the effort we put everyday on Dice Age, is a misconception. Our apologies go to those who are disappointed, and we want to thank the patient majority. Today, one fifth of the backers have received their dice, that is 3000 dice each hand made and hand painted. After several failed attempts to find a local production solution over the last year, Tristan found that he was the only one able to build the dice locally. It currently takes eight hours to build a single reward, and we are able to manufacture two sets a week. Some backers received their reward a year ago, and at this rate, it would take another four years to fulfill all rewards, which obviously is not how we want things to go. But this process is only our proof of good faith until the issue of manufacturing is resolved. We are back on developing a viable outsourcing solution to produce the dice industrially, in China, as intended. This implies an evolution of the product, as well as looking for the right providers, taking into account all aspects that made our first attempts unsuccessful. Therefore, one cannot think "estimated time of delivery" as long as this outsourcing production is in process. When this is done, the phoenix will be reborn and we'll be able to post an update as such. In anyway, everyone will get his/her dice. We intend to fulfill the Dice Age project, because it is awesome, and nothing is going to stop us.